You may think that cheap wedding rings will look ugly or be made of poor quality. But while designer wedding rings or handmade wedding bands can cost a small fortune, there are thousands of other rings available that will suit any budget. My own 18 carat 2 color gold wedding band cost under $500. Admittedly that was 10 years ago, but it came from a high quality private jeweller with only a small stock of each type of ring, so I felt I had something unique. My solitaire diamond engagement ring did cost a whole lot more, but I'm the kind of girl who only ever wears a few pieces of jewellery - my two rings, a white gold bracelet and the diamond earrings and pendant given to me by my husband on our wedding day. Who needs more? Whatever your budget, just follow my tips to find a ring at the right price. First set a budget for your rings. With prices ranging from under $100 for discount wedding rings to $1000+ for vintage or unique rings and $1500+ for diamond rings, without a budget you will find shops trying to sell you rings you cannot afford. Next, visit a few jewelry stores and either window shop or ask to see rings within your budget. Make a note of the styles you like and the prices. Try a few styles on to see how they look with your engagement ring if appropriate. Back at home, compare prices online for the ring styles you liked best. 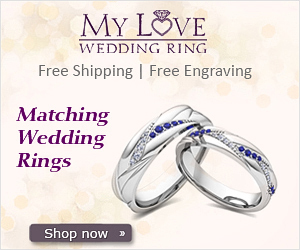 It will almost always be cheaper to buy your wedding rings direct from a specialist online store and many of these like My Love Wedding Ring offer unique ways to customize your ring too. Good online wedding ring stores will allow you to try samples before ordering for a small fee so it can be just as easy as buying from the high street. The type of metal used will make a great difference in price. Platinum, for example, may be ultra trendy but it's expensive compared to white gold which is half the price. If you want the durability of gold but a silver look and can't afford white gold, then titanium is a great value choice for cheap wedding rings plus it is very hardwearing. Then of course there is always silver, cheaper yes but it's the symbolism of what it stands for that counts. You can cut the cost of your ring by choosing a lighter weight. 9 carat gold is lighter and cheaper than 18 carat gold although it is less hard wearing. Basically the thinner and lighter the ring, the cheaper it will be. A thin ring is not a bad thing if you have small hands as a chunky ring will simply look silly. Whilst it may be traditional to have his and hers wedding bands, many men do not like the thought of wearing jewelry. Why bother to spend money on a ring when it will end up stored in a drawer never to see the light of day? Save money and put the cost towards either a better quality ring for the bride or put it towards your honeymoon! Keep the styling simple to save money. A simple plain wedding band is the obvious choice for a low budget. Make it special by engraving your names on the ring which only costs a few dollars for a simple message. If you have your heart set on a unique wedding ring but the budget just won't stretch, consider buying a simple plain ring for the wedding day and plan to buy the ring of your dreams on your tenth anniversary. Something to look forward to when hopefully you will have the money!